It may come as a surprise to many, but you can paint your old kitchen and bathroom sinks – even your counter tops. This would have been an unthinkable practice just a few years ago, but today the idea is beginning to catch on. There are several reasons for this trend. The most obvious one is money, since a sink can usually be painted for a fraction of the cost of buying a replacement. Secondly, new improved paints have been hitting the market, offering all kinds of exciting metallic colors and gritty textures. With this in mind, painting a fixture, previously believed to be unalterable, can freshen up a room without a major overhaul; and those with an artistic inclination, now have a new canvas on which to express themselves. No matter what drives you to paint your sink or counter top, there are three major factors which will determine your success: the type of material you are covering, the quality of the painting products being used, and, of course, your technique. Copper, bronze, and stone sinks, such as marble or granite, are less likely to be painted because they are usually purchased for their unique aesthetic qualities, and they are an expensive investment. That leaves glass, porcelain, and stainless steel sinks; and acrylic and laminated counter tops, as the types of materials to be painted. Generally, the smoother the surface, the less likely paint will adhere to it -- and counter tops and sinks are purposely quite smooth. Today, however, better primer and epoxy paints make the adhesion process much more successful on these surfaces. Here's the general procedure for painting a sink. Counter tops follow comparable steps. After deciding to either remove the sink and paint it in a more accessible location, or leave it in place and mask off the surroundings; the first step is to repair any chips or mars on the surface. Several products are available to handle this. Next, the surface needs to be washed with an appropriate degreasing solution. Once cleaned, it's time to rough it up so it can accept the paint. Depending again on the type of surface material, this can be done with acidic solutions, sandpaper, steel wool, etc. Once prepared, a special bonding primer paint, appropriate to the material you're resurfacing, is applied according to directions and allowed to cure. Finally, its time to paint. Most sinks will require a special epoxy paint which hardens evenly and has a tough, glossy appearance. 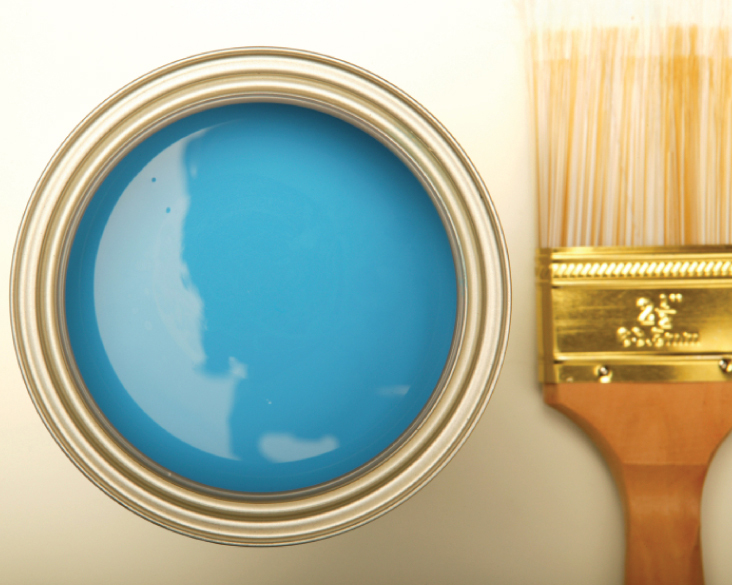 The paint can be applied by spraying or brushing depending on the manufacturer's directions. Often, a few finishing coats of clear polyurethane are applied for further durability. Only your imagination can limit the options of sink or counter top transformations. Here's just a few possibilities. If your sink is porcelain, you can simply give it a fresh white finish, or change it to any new shade you prefer. But, you also could draw out your inner artist and hand-paint custom accents around the bowl using special paints. If you like that contemporary look of your stainless steel sink, you can simply refresh its finish with a couple coats of stainless steel paint. But, you also could add to the overall stainless appeal of your kitchen by using that unique paint to seemingly transform your laminated counter top into a stainless steel one. If you've got one, its a good bet you're tired of that dated avocado-colored acrylic bathroom sink. Today you can paint it almost any new color. But, with the textured paints available, you could even convince most that you installed a stunning new granite sink. If you have a glass vessel sink you probably love it; but maybe it's not quite fitting into your new color scheme. Consider painting the underside of the bowl for a stunning accent. Or, using specialized glass paints, you could decorate the edge with your own hand-painted designs. No matter what approach you take, make it a safe one. Ventilate the work area. Use the proper paints. Wear a mask and gloves. Consult local experts. And read the directions. Although the techniques and materials for this type of project has come a long way, there are some practical limitations. Keep in mind that sinks and counter tops take a lot of abuse. Even the best hand-painted effort will not last forever and can still be susceptible to chipping, fading and staining. For those who are somewhat handy and a bit artistic, painting your sink or counter top can be a rewarding endeavor. If not so adventurous, keep in mind that there are professionals who can do it for you. And, of course, you might simply buy a new sink from the ever-growing selection of exciting designs.